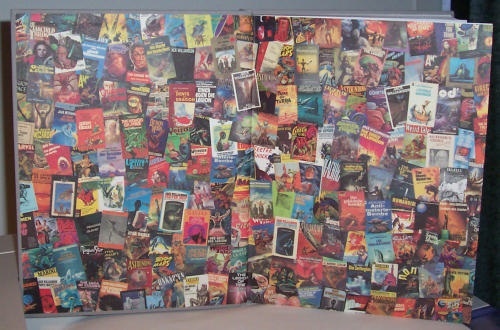 A literary and visual feast, this 8.5" x 11" 603 page hardcover celebrates the first seventy-five years of Jack Williamson’s career in Science Fiction. From "The Metal Man" in 1928 to his recent Hugo and Nebula Award-winning novella "The Ultimate Earth," inside are some of the best of Williamson’s stories, including excerpts of such classic novels as The Legion of Space, Golden Blood and The Legion of Time. Also included are several never-before-published gems such as a vintage 1930s tale "The Crystal Castle," a collaboration with long-time friend Edmond Hamilton, and a story originally commissioned for Last Dangerous Visions, "Previews of Hell." Sidebars with essays, correspondence, and articles are decorated with over 300 book and magazine covers and interior illustrations. 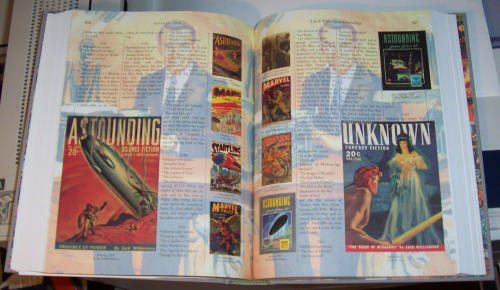 A full-color 32-page section features an illustrated timeline of the author’s career, and reprints a complete story arc from Jack Williamson and Lee Elias’ 1950s Sunday comic strip, Beyond Mars. 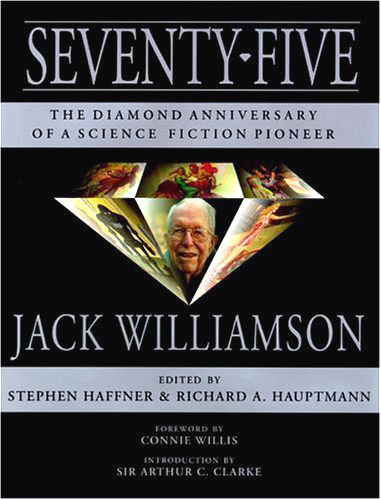 Seventy-Five: The Diamond Anniversary of a Science Fiction Pioneer also features a foreword by award-winning author Connie Willis and an introduction by a fellow pioneer, Sir Arthur C. Clarke. Sidebar: Excerpt from "The Prince of Space"
Sidebar: Excerpt from "Darker Than You Think"
Sidebar: Excerpt from "The Electron Flame"
"The Rajah McCarthy and the Jungle Tomato"
Sidebar: THE HUMANOIDS ARE ON THE AIR! "The Next Century of Science Fiction"
"People Machines: Hints for Design and Assembly"
Sidebar: BACK TO THE CLASSROOM by Patrice Caldwell, Ph.D.
“What a magnificent book! The quality of the fiction isn't news to me, of course, but I'm bowled over by all the accessory stuff wrapped around it. It's a really splendid editing job." 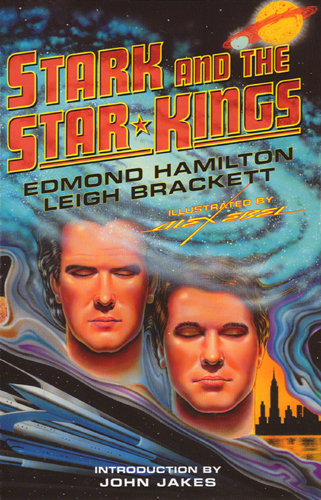 Starred Review "A true labor of love, this glorious tribute to Williamson’s prestigious sf career has been assembled by publisher Haffner and Williamson bibliographer Hauptmann. 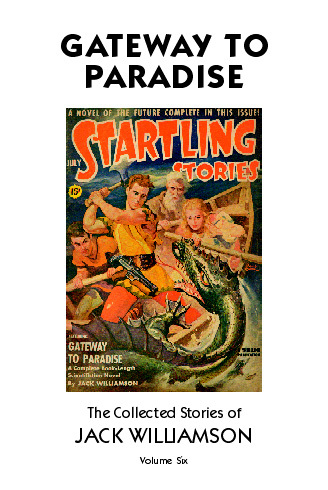 This massive illustrated collection runs the gamut, including numerous short pieces (some appearing for the first time) and excerpts form novels plus numerous color reproductions of Williamson’s 1950s comic strip, Beyond Mars. The pages are buttressed with illustrations and cover shots plus sidebars providing a plethora of info on Williamson and his work. Superb." "What a well-done book! Nice touches abound, including about thirty pages of color in the center which include the 1954 "Beyond Mars" comic penned by Williamson. My sincere congrats to Stephen and to Jack." ". . . he's SF's grand sequoia, and trying to review a book like this is somewhat like trying to review a sequoia. When people speak of him as a "pioneer," the word takes on an astonishing dual meaning, since he actually lived the early part of his life at the tail end of the pioneer era, having been born in the Arizona Territory and having traveled in a covered wagon in his boyhood. He knew Gernsback, and became such a popular contributor to the 1930s pulps (most notably with "The Legion of Space" and "The Legion of Time", both excerpted here) that he was already in danger of becoming superannuated when Campbell's Golden Age began to take shape in the early 1940s. But he adapted, providing Campbell with his famous "Seetee" stories and "With Folded Hands"--perhaps his single most famous tale--and he adapted again when Campbell went wonky with Dianetics and the Dean Drive. He began to publish novels with specialty presses as early as 1947 and with mainstream presses as early as 1951, introduced a syndicated comic strip in 1951, and started a series of collaborations with Frederik Pohl in 1953. He became an early champion of SF in academia, earning his bachelor's degree in 1957 and his doctorate in 1964 (with a dissertation on Wells, also excerpted here), the same year he introduced an SF course at Eastern New Mexico University, which eventually named its Liberal Arts building for him. And on and on. 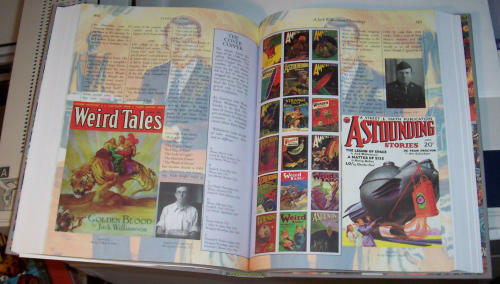 All of this and a great deal more is catalogued in sumptuous detail in this generously illustrated book, which includes his earliest pulp stories, bibliographical notes, memoirs (the piece on Edmond Hamilton is especially touching), tips on writing (most of them disarmingly basic), essays, a lengthy color excerpt from the "Beyond Mars" comic strip (which has not really aged as well as some of the early pulp tales), glossaries (including one listing terms he invented or promoted, such as "terrforming" and "genetic engineering"), and endless photos, cover and interior illustrations, and chronologies. 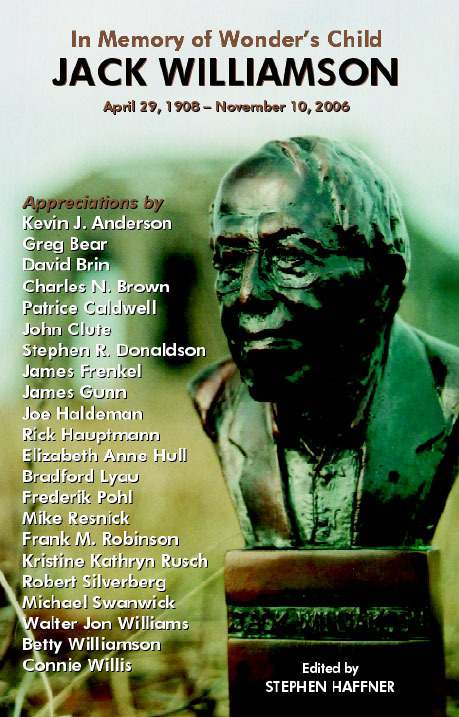 "Any true fan of Williamson's must spring for the massive and classy commemorative volume issued by Haffner Press. Seventy-Five: The Diamond Anniversary of a Science Fiction Pioneer contains copious fiction, facts and photos relating to the Grand Master's life and career." GRADE 'A' ". . . a lavish collection of his classic science fiction and related nonfiction, starting with an introduction by a relative newcomer to the genre, Sir Arthur C. Clarke—now 86—and a foreword by Connie Willis , who reminds us that Williamson invented the terms “android," “genetic engineering" and “terraforming." Included are “The Metal Man," the story that started it all; “With Folded Hands," the famous nightmare vision of a future in which robot “servants" are so insistently helpful that humanity is ultimately enslaved by them; excerpts from the fast-moving pulp novels Golden Blood, The Legion of Space and The Legion of Time; samples of the Sunday comic strip Beyond Mars; and “Collision Orbit," a tale from the “seetee" cycle, a word derived from CT, short for “contraterrene," an early term for antimatter, which, in these popular space adventures, provides a source of immense energy. 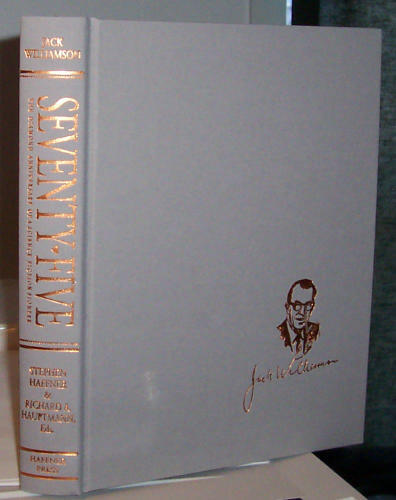 Seventy-Five is profusely illustrated and handsomely produced and designed. The book brought back the fun of the science fiction I read so avidly in my youth—some of it, of course, by Jack Williamson. I look forward to another volume from him in four years, when he celebrates his first century."